The Psychogenealogist Pic of the Week (#80) - "A Line from West York"
Here is a colorful, quirky, and well preserved 111 year old post card sent from West York, Illinois. A dapperly dressed man stands in front of a clothesline with pajamas and tablecloths on it. The inscription below says, simply: "A line from West York." If you zoom in to the man's right foot, there appears to be a copyright of the image that says: "Copyright 1905 by P. Sander NY". A google search for that copyright name turned up several similar postcards of the same time period. 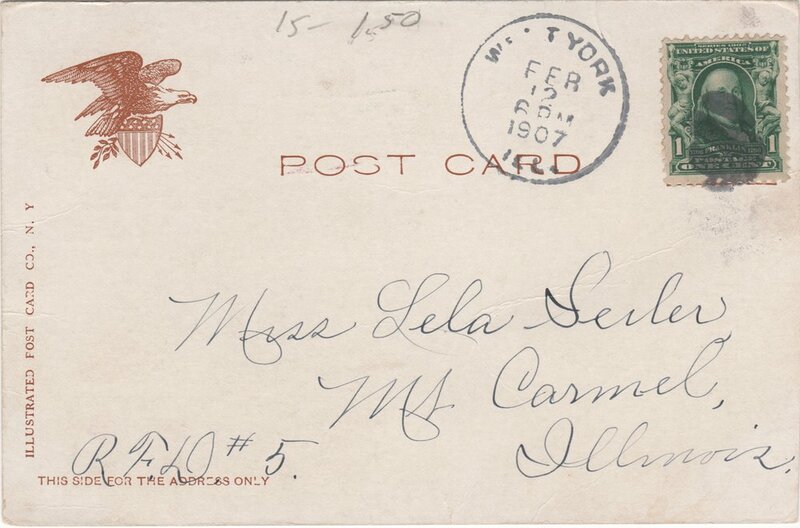 This postcard is postmarked from West York, IL on February 12 of 1907. It is addressed to a Miss Lela Seiler in Mt. Carmel, Illinois. The address is listed as R.F.D. #5. Mt. 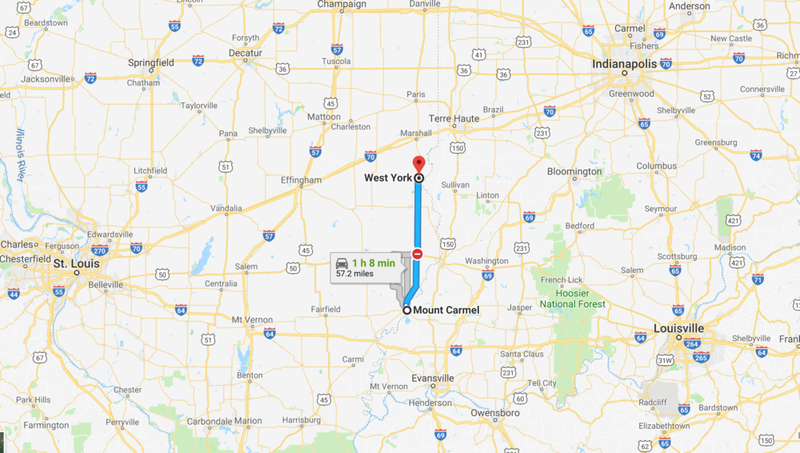 Carmel, IL is just about 60 miles directly south of West York. Both cities are equidistant between St. Louis, MO and Louisville, KY. There was a 16 year old Lela Seiler living in Mount Carmel in 1910. Given that the present day population of Mt. Carmel is only just under 7,000 people it seems quite likely that this is the right (and only) Lela Seiler. I would bet $100 on it. In 1910 Lela lived with her parents, Sebastian and Lizzie Seiler, and what appear to be two cousins (listed as niece and nephew to Sebastian on the census). Paul Grundon was 13 and (presumably his sister) Mabel Grundon was 9. There is another Seiler family living next door (on the next census page) that is most likely related to Lela. This is the kind of post that, if I didn't stop myself, I could spend hours researching! I did a newspaper.com search for Sebastian Seiler and about 40 articles popped up in the Daily Republican Register of Mount Carmel. In fact, this 1977 article details an 81st annual Seiler family reunion. It is filled with info, names, and facts that you could explore. So, there you go. Feel like learning more about Lela's story? Have at it and let me know what you find. Here are some questions to guide your inquiry. Is this the right Lela Seiler? The Seilers appeared to be a prominent family in the area. What is their history? Their story? Who sent the postcard? A friend? Cousin? What was life like in 1907 West York or Mt. Carmel, Illinois? What do you think, feel, and wonder about as you look at the postcard and review the information discovered so far? What is Lela's story? Is there anyone alive who could fill in the gaps? Are their family members who might like to have this postcard sent to them as a keepsake and heirloom of their family's history (if so I am happy to send it to them)? Happy Hunting! As always, let me know what you find out.